YES the time of readalongs is nigh at hand, as Master and Margarita is starting NEXT MONDAY (posts posted whenever on that day) and it has gotten me thinking about what's next. I personally am on a mission to read some Tolstoy, and it must be with a group, becuase otherwise itw ill never happen in my lifetime. So! War and Peace and Anna Karenina are both possibilities (using Volkhonsky and Pevear), but what else! What have people wanted to read and have just never gotten up the energy to get through? It doesn't have to be long. 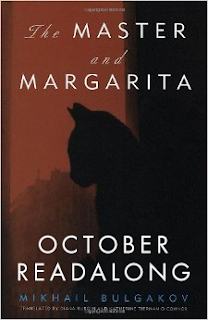 Hell, Master and Margarita isn't long, but enough of us owned it and had never read it that it seemed one of those books we just needed a group push to get through. So! Tell me things! Authors! Do we want to read that one book by our beloved Wilkie that I have forgotten the name of? I don't think it's No-Name, but ha. There's some other famous one. And there's sci-fi! We haven't done sci-fi. And there's...there're other genres I've forgotten but which are probably muy importante and should be considered and read together and have GIFs applied to them. THROW BOOK NAMES AT ME. Master and Margareadalong in October! Was Carrie Nation Just Insane?